We’ve got our first real cold snap going on, with the threat of snow on the way. 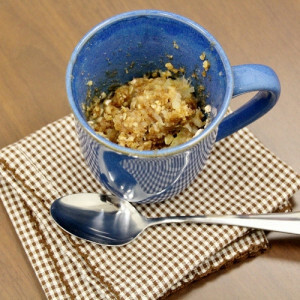 What better way to warm up than with a hot mug of apple crisp that only took 2 minutes to make? I love the idea of making a quick dessert to enjoy in the evening, without making a whole pan for just Garrett and me. Mug desserts are an easy way to get just the right amount of that rich treat you’re craving. 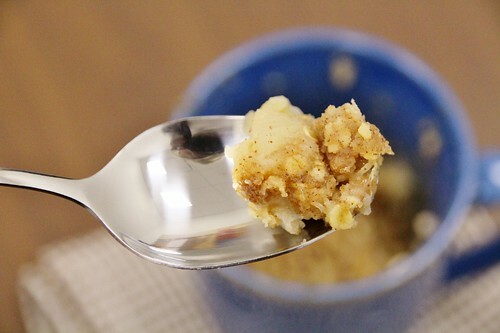 Apple crisp is one of my favourite desserts and I love my Nana’s recipe which I normally use. I strongly suggest that you give her recipe a try, but it’s also nice to have a quick version in your back pocket too. Warm soft apples with a cinnamon oat crumble on top. Delicious! Peel the apple and cut it into thin slices. I find that thinner slices cook evenly in the microwave. Place slices in a microwaveable mug or small bowl. Microwave for 60 seconds. Meanwhile, combined the remaining ingredients and crumble together with a fork. 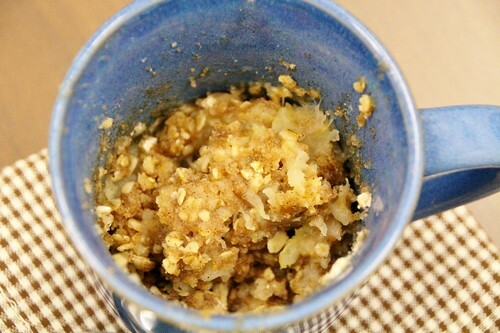 Stir the cooked apples and then sprinkle the topping on top. Microwave for 30 seconds. Stir and then microwave for an additional 30 seconds. Allow to cool for 5-10 minutes and then top with a of ice cream or a dollop of whip cream. 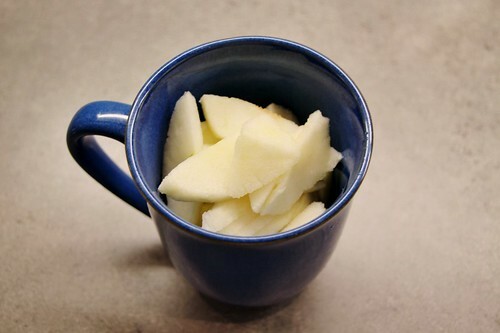 Peel the apple and cut it into thin slices. I find that thinner slices cook evenly in the microwave. 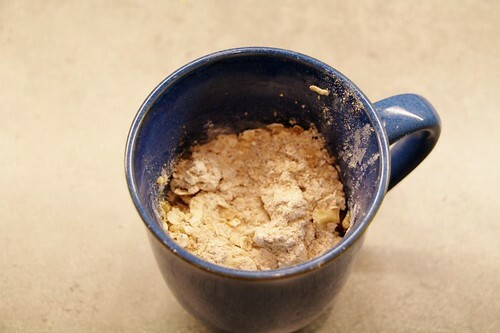 Place slices in a microwaveable mug or small bowl. Microwave for 60 seconds. 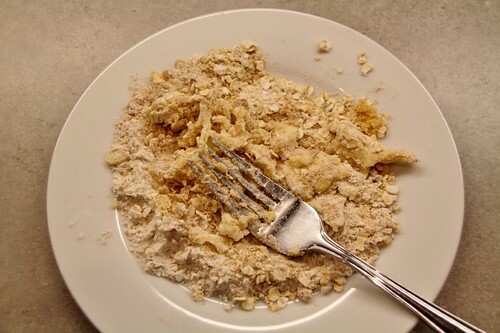 Meanwhile, combined the remaining ingredients and crumble together with a fork. I just reuse the plate that I cut the apple on. Less dishes! Allow to cool for 5-10 minutes (the hardest part is waiting!) and then dig in. A scoop of ice cream or a dollop of whip cream are a nice touch on top. You could pack this apple crisp up for an afternoon pick-me-up at work too. Just measure out the crumble ingredients into a small plastic bag and slice an apple at home with a sprinkle of lemon juice to prevent it from going brown. Then it’s as easy as tossing it in a mug on your break! Um. I’m all OVER this. Aw man, my mommy brain, there is butter in the recipe. I was just excited on how quick it is to make, I skipped over the ingredients to fast! I replaced the butter with 1tbls of applesauce, it turned out great made this recipe vegan and cuts out 100 calories of fat. Just looked up this egg cooker and it looks awesome! I thought it was plastic, but its actually stoneware. I’m sure it would work for the apple crisp too. This is delicious! I am sitting here eating it now! Thank you for sharing this. The recipe looks good but I was so distracted by “without making a whole pan for just Garrett and I” that I had a hard time concentrating on the recipe. Please fix your grammar so nerds like me won’t be distracted. It should say “Garrett and me”. “I” cannot be a direct or an indirect object. Looking forward to trying the recipe! Hey J! Thanks for the grammar correction. It’s an old habit from a bad English teacher that I’ve never quite gotten. Hope that you like the recipe. O My gosh, love it! I just made it for the first time and eating it still warm yummm. I have some dates and walnuts in there too. Next time i will put more oats in it. Dates and walnuts sound like a great idea! I’m so glad you liked the recipe. Let me start by saying I am not an apple crisp expert I am much more of a chocolate fan for an example I wound not order a apple crisp from a restaurant but I would definitely order a chocolate cake or ice cream. Anyways, for some strange reason I got a huge cravings for some nice warm apple crisp but I didn’t want a lot because I didn’t know if I would actually like it and I also didn’t want a big mess. So after searching a lot of different recipes I found this and it was the first apple crisp recipe I’ve made and it was delicious! just amazing with a scoop of vanilla ice cream it satisfied my cravings and was exactly what I wanted. So thank you so much for sharing and posting this delightful recipe I will definitely be making it again. 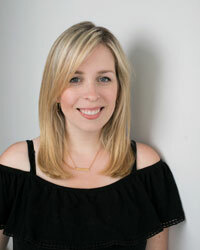 I like to see how nutritious I can make recipes without my family complaining! I added chopped pecans for some protein and crunch. I substituted wheat flour for the white, to add a bit of fiber. In mine, I used stevia, because I’m avoiding sugar. I left the peels on the apples, partly to save time, and partly to add nutrients. When the apples are sliced thinly, the peel doesn’t intrude. I cooled it with milk (and added whipped cream for fun). I’ll bet I could add yogurt too, for more protein and a little flax seed or wheat germ. 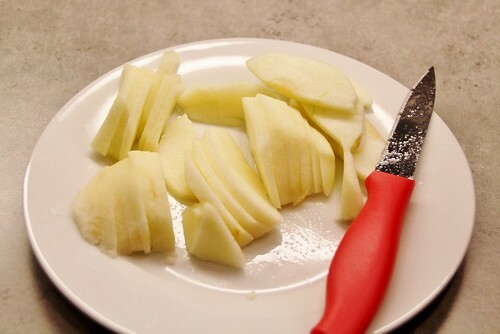 When I make it again, I will prep the dry ingredients and chop the apples the night before for a fast morning breakfast! Thanks again! That sounds like such a yummy dessert, Alta. 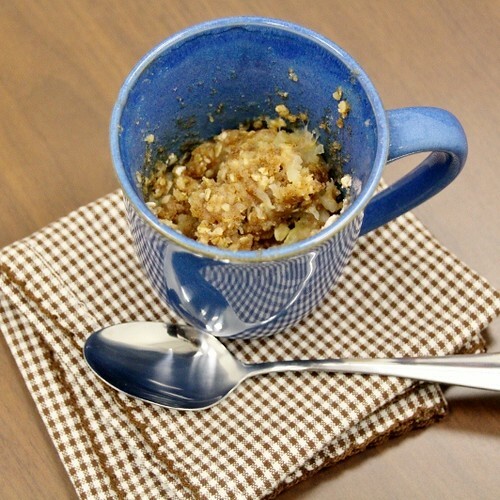 For another oatmeal recipe that is always a hit, try my Baked Oatmeal (Apple Version and Berry Version). I love to make it when we have company staying over or on weeks that I know the mornings will be busy. I had a few apples in my fridge that were meant for a big batch of Apple crisp that was never made. After dinner tonight I had some extra time and thought to make individual crisps. I found this recipe and decided to try it. What a great idea! It’s a “why didn’t I think of it?” kind of idea. It’s. A quick and easy treat. Just slab on some vanilla ice cream and it’s delicious. Thank you for sharing this!